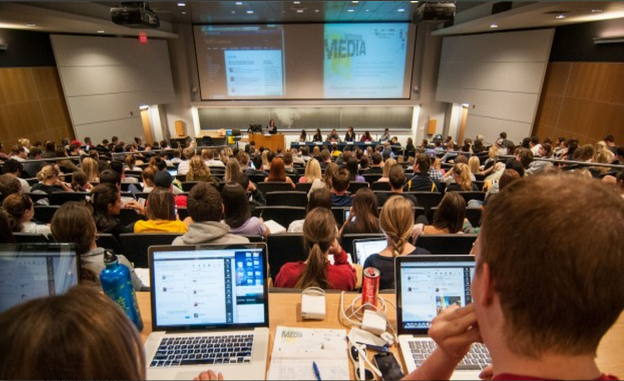 Students blog live during the “Coding for the Future” panel at the West Virginia University P.I. Reed School of Journalism. This guest post is co-authored by Dana Coester. Data Visualization, geo-mapping, audience engagement, agile development, responsive design. What do any of these terms have to do with journalism? Turns out, quite a bit these days. With a staggering amount of data now available to journalists, the ability to capture, interpret and present it to audiences has become a critical skill. 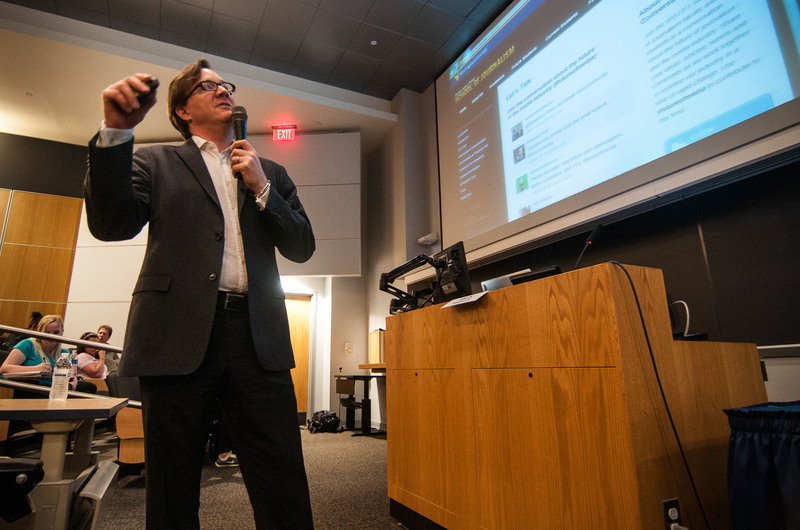 “This is going to be part of a reporter’s job, at some level, for almost every reporter,” Derek Willis, an interactive developer at The New York Times, said a few weeks ago at “Coding for the Future: The Rise of Hacker Journalism” hosted by the West Virginia University P.I. Reed School of Journalism. “We’ve got to face the facts,” said Willis, a Knight News Challenge winner who is pioneering new ways of reporting election data. Moderated by Erin Reilly, creative director of the USC Annenberg Innovation Lab, the panel consisted of six self-described “hacker journalists,” who are helping transform digital storytelling for modern audiences by building open-source news apps, visualizing and mapping data, and revolutionizing election reporting. In a rapid-fire Ignite-style discussion, the journalists addressed the challenges and opportunities in inventing new practices and acquiring new skill sets on the front lines of big data. And they called on students to become change agents in their future profession. 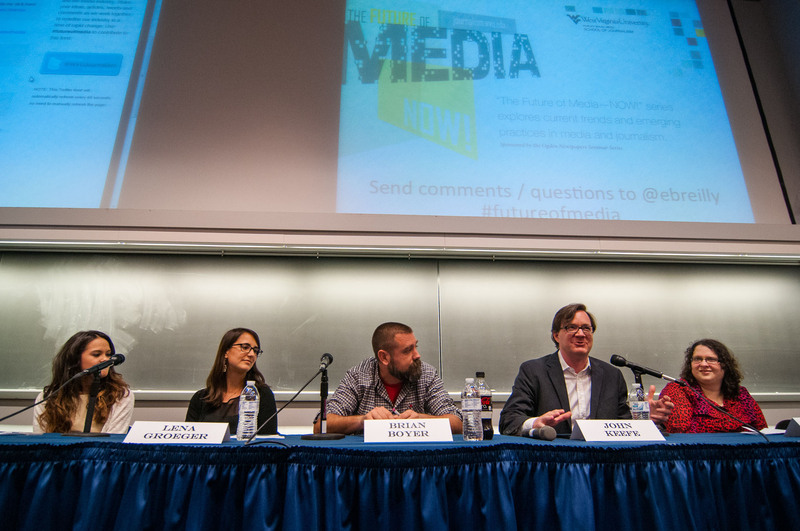 “The real future of media here is you,” said Lauren Rabaino, The Seattle Times’ first news applications editor. When it comes to meaningful coding that can be changed on the fly, this assembly line process simply isn’t nimble enough, said Rabaino, who advocates engaging all stakeholders in producing a story — the designers, the coders, the reporters — throughout the entire process. “We want to empower people. We want everyone to be the cool kid in the newsroom,” she urged. Brian Boyer, news application editor at NPR, evangelizes agile development as a process for building collaborative teams and transforming newsroom culture. Agile programming is a core concept in software development but lends itself to building dynamic news teams that are flexible and able to work quickly in breaking news situations. With data growing exponentially and the pressures of 24/7 digital news cycles, journalists need to learn coding skills to build databases and other interactive tools. The good news is that acquiring those skills, particularly at the basic level, may require more curiosity than cash. The drive to experiment and a do-it-yourself approach is a common thread among hacker journalist culture. And from their perspective, it’s easier than you might think. A designer by training, Lena Groeger, news application developer at ProPublica, taught herself how to write code using video tutorials and other online resources. Boyer suggested starting simple, doing relatively easy things like “screen scraping,” which involves creating small bits of code to collect data from websites. John Keefe, senior editor for data news and journalism technology at WYNC, New York Public Radio, suggested using inexpensive tools, such as sensors, to generate your own data. He shared a DIY-styled project about tracking cicada populations by measuring soil temperatures. “You can buy all the parts at Radio Shack with step-by-step instructions. Anybody can do it. Trust me — I’ve seen children do it,” Keefe said. Being able to turn content into code can be a powerful tool for modern journalists. But understanding how to filter data, sort it, and discover its hidden stories is what gives journalists a true reporting edge. Data provides context to anecdotal reporting and can be used to hold institutions accountable, Willis said. The New York Times’ 2012 Money Race is an example of an interactive data visualization that tracks campaign financing. But when it comes to data, Willis worries that politicians and others are far more sophisticated than journalists in their understanding of how to use and manipulate it to their advantage. “We’re bringing knives to gun fights. We’re banging rocks together,” he warned. Minkoff says journalists need to consider data as a potential source like any other. “You have to interview the data,” she said. When studying data, look for both trends and outliers and think of what questions you want to ask before delving deeper. 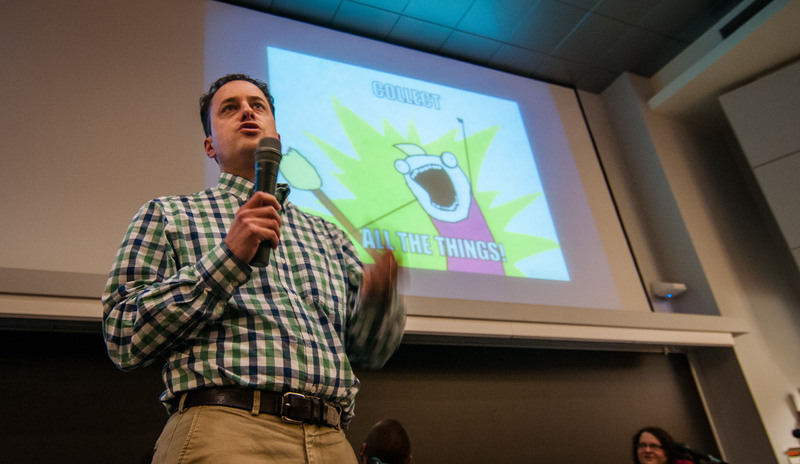 “We are journalists first — programmers second,” Minkoff said. Another recurrent theme was the essential role of audience in interactive news development, with sensitivity to device. Boyer developed a “mobile-first” philosophy at the Chicago Tribune, where his news application team tried to determine the best ways to engage users with content. It’s not just about device. It’s also about strategy. When Groeger started at ProPublica, she learned a key concept for building stories that matter to audiences. “Think about the near and the far,” Groeger said. First, you have a far view for setting context and telling the readers broadly why they should care about the story, she said. Second, you have a near view, “which is the personal story, the specifics, your own town, your hospital, your school — all the details that matter to you.” Boyer shared an example of the “near and far” approach. Fire Forecast, NPR’s treatment of last year’s wildfires in the western U.S., enabled users to determine the likelihood of fires spreading to their areas. Through a live Twitter feed and blog, the panel discussion sparked a conversation among our faculty and students about how to adapt curriculum and practice to the changing paradigm. Journalism graduates who are data “literate” and have even basic coding skills are highly marketable. Teaching these skill sets needs to be part of the J-school curriculum. Reporting isn’t just about talking to people; it’s about using all available sources of information, including databases and spreadsheets. Learn to collaborate with your colleagues and your audience. The goal is to develop tools and applications that create a meaningful experience for the user. The most important skill you can cultivate is intellectual curiosity. It will enable you to continuously adapt to an ever-changing world and profession. The panelists encouraged students to face the future with optimism, enthusiasm and a sense of adventure. Maryanne Reed is the Dean of the Journalism at West Virginia University P.I. Reed School of Journalism. 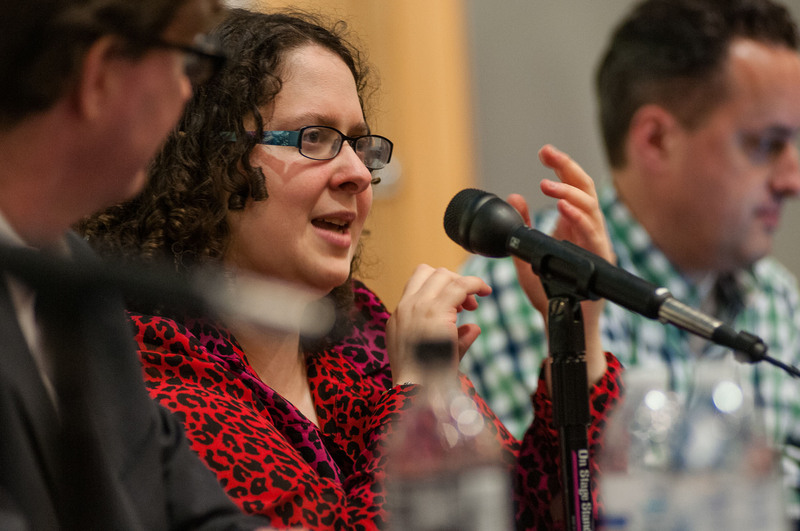 Dana Coester is an Assistant Professor and Acting Creative Director of the school’s up-and-coming Media Innovation Center. Journalist are journalist first and journalist second. Period. Pretending doing the job of an engineer is like becoming also a lawyer because there are legal issues involved in reporting news. Let’s be the best are at what are and what we love. But our duty as journalists is to shed light on what is happening. These skills help people do that. Yeah, sure, most journalists will never be awesome coders but by taking the time to learn basic skills in this area you can already unlock so many potential stories. Journalists need to know basic law to work effectively in a newsroom. Why should it be any different with coding? Nobody at that table writes code. If they did, they would know that the time it takes to build would leave them no time for journalism. This is another group of people trying to be cutting edge but with no clue what they’re talking about. If they mean just an HTML layout, there are hundreds of point and click CMSs that remove the need to know any code.